A Plethora of Flour Mills – c. 1920s photo. 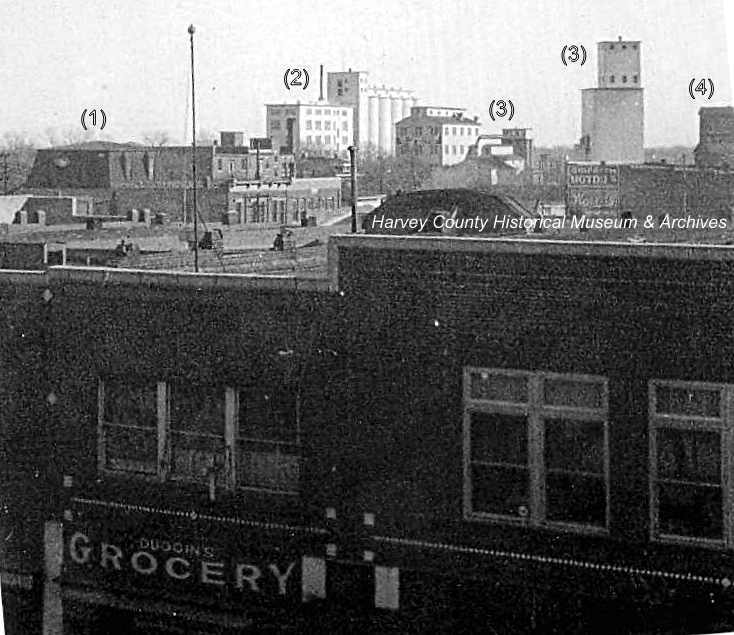 Each flour mill in Harvey County encountered adversity, whether due to abundant competition, technology changes or calamities like fire or flood. Adaptation was critical as farming practice transitioned away from spring wheat to the high yield, hardy Turkey Red winter wheat. Having iron or porcelain rollers, the latest in milling technology, was essential for the “gradual reduction” process. The result meant replacing the old stone burrs at considerable expense. In Newton and on the north side of the AT&SF tracks were the (1) Claassen mill, (2) Goerz mill, (3) Consolidated mill and (4) an elevator for Newton Milling & Elevator. On the south side of the tracks were Newton City Mills and Newton Milling & Elevator (formerly Monarch Mills). The building in the foreground housed Duggins Grocery at 516 Main, Newton. Photo Source: HCHM Collection.